When I was a guest on Dr. Michael Brown's nationally syndicated radio show "Line of Fire," our conversation focused on a chapter in my book Jesus Uncensored, entitled "The Ethnic Cleansing of Judaism in Medieval and Renaissance Art." Here I show that classical artworks washed out all traces of Judaism in the personae of Jesus, his family, and followers -- despite the fact that they were all dedicated practicing Jews throughout their lives. The process of totally Christianizing the Jesus circle placed an artificial wedge between Judaism and Christianity that remained in place for centuries. As late as the nineteenth century a painting of Jesus and his family by British artist John Everett Millais and another of the twelve-year-old Jesus by German painter Max Liebermann met with public uproar because they were deemed too Jewish. Lieberman repainted his young Jesus, rendering him blond with no indication of his Middle Eastern Jewish ethnicity. He took the Jew out of Jesus, which soothed and pleased the critics. "While I was in high school -- a Catholic high school -- we had a project to draw in class. I drew a picture of Jesus, but removed his golden locks and blue eyes and replaced them with a more Middle Eastern looking man with thick hair. The teacher lost her mind. All this resulted in a trip to the Dean's office, as if I offended her. All I heard was 'why does it matter.' So I said, 'You tell me why it matters. I don't recall too many blond-haired, blue-eyed people from that region of the world.'" In commentaries and descriptions of exhibits of artworks depicting Jesus, we never hear that these paintings, as magnificent as they are artistically, distort and falsify biblical history. Renaissance artists revolutionized art with the introduction of realism and naturalism over the earlier artificialism and primitivism. Unfortunately, naturalism and realism did not extend to who the figures were naturally and realistically in their actual lives. Art historians with whom I've spoken dismiss these criticisms as ignorance about the Renaissance style of contemporizing figures in painting -- dressing people in contemporary Renaissance attire and picturing them in Renaissance settings as Northern Europeans in skin tone and physical appearance. While it is true that this kind of historical distortion was commonplace in Renaissance painting, it does not explain the obliteration of Jesus' and his family's true identities or the pictorial conversion of orthodox Jews into latter-day Christians. Nowhere in these artworks is there a hint of the subjects' Jewish identities or origins. 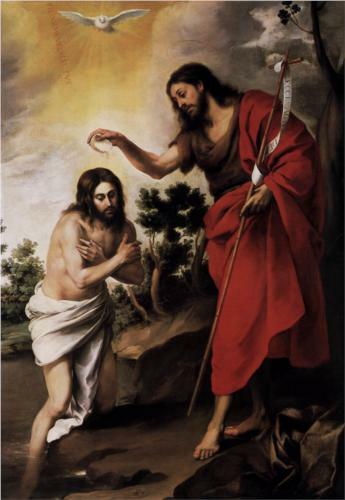 For example, Bartolomé Esteban Murillo's sixteenth century painting The Baptism of Christ pictures John the Baptist baptizing Jesus -- an act reported in the Gospels (Matthew 3:13-17; Mark 1:9-11; Luke 3:21-23). Curiously, Jesus and John are not dressed in Renaissance attire, but John is holding a crucifix staff, thus telling the viewer that this is a Christian event and a Christian conversion. The fact is that there was no Christianity at the time of this baptism, nor did John or Jesus have any intention or desire to launch a new religion. Neither Jesus nor John ever heard the word "Christian"; it does not appear in the Gospels, although the term "Jew" appears eighty two-times. Moreover, John only baptized Jews -- purifying them with the ancient Jewish practice of baptism for the coming of the Jewish Messiah. Murillo's powerful image supports the false conclusion that Christianity was already present. Consider too that the cross was a hated symbol in the time of Jesus and John the Baptist -- a reminder of the countless times Jews were brutally crucified by the Romans. Jesus and John would very likely cringe at the image of the cross in this depiction. The cross didn't become a Christian symbol until the fourth century CE, when it was introduced by the Emperor Constantine on his military banner and shields. No wonder that it didn't catch on promptly as an endearing Christian symbol. What has been overlooked by art historians and other apologists is that the pervasive distortions of biblical history in misrepresenting Jesus, his family, and followers established a powerful foundation for anti-Semitism -- anti-Semitism by omission. In stripping away Jesus' Jewish identity these paintings implanted the firm conviction that Jesus was of different ethnicity and religion than the others -- the Jews. This conclusion was made even more explicit in paintings like The Tribute Money, by Peter Paul Rubens (1612), and Albrecht Durer's sixteenth-century Christ Among the Doctors (Pharisees), both of which depict a blond ethereal Jesus in contrast to the dark, menacing and ugly Jews -- the others. If we were to restore the authentic ethnicity of Jesus and others, these painting would be strikingly different, even while preserving the "Renaissance style." Consider, for example, Michael Pacher's fifteenth century painting The Marriage of the Virgin, which depicts the marriage ceremony (some say betrothal) of Mary and Joseph. In reality, Mary was a thirteen-year-old Jewish girl from a rural village in Nazareth. Her betrothal and marriage was to Joseph, a working-class Jew originally from Bethlehem. After their marriage they showed their dedication to Judaism by taking the arduous seven-day trip to Jerusalem every year to celebrate the Jewish holidays, particularly the Passover festival (Luke 2:41). In Pacher's painting, Mary and Joseph are Christians, with the marriage ceremony performed by a latter-day Christian high church official in a Christian setting. Mary and Joseph's Jewish identities are erased. 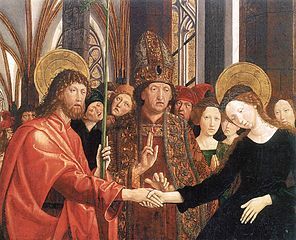 Several other Medieval and Renaissance paintings of the marriage also Christianized this Jewish marriage ceremony. Similar misrepresentations of other scenes and events are typical and routine for classical artworks. In recognition of the power of imagery, it's time to counter these paintings with more authentic ones that tell the true story of who Jesus was. I've often wondered what many of the classical artworks would look like if Jesus' ethnicity was restored. To answer this question I'm developing a proposal for an art contest and exhibit, "Putting the Jew back in Jesus." Stay tuned! Bernard Starr is a psychologist, college professor, and journalist. He is author of "Jesus Uncensored: Restoring the Authentic Jew." Website: click here.